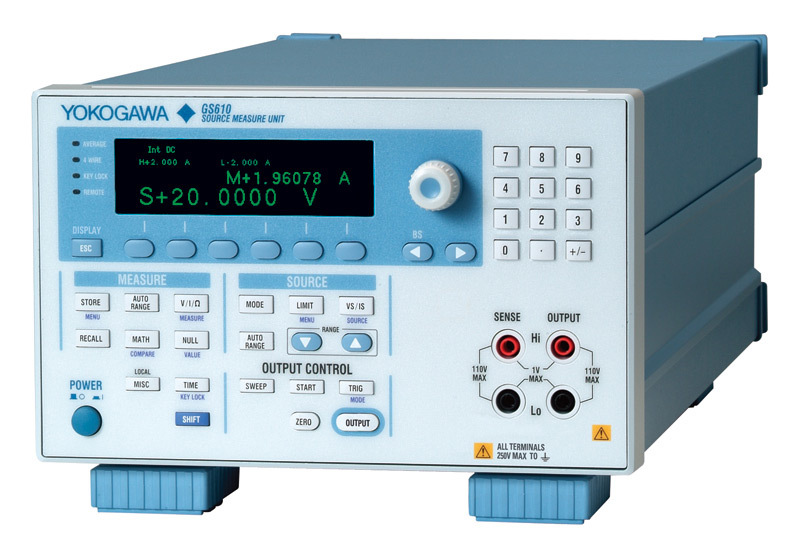 The GS610 is a highly accurate and highly functional programmable voltage/current source that incorporates voltage/current generation and measurement functions. The maximum output voltage and current are 110 V and 3.2 A, respectively. Evaluation of over a wide range of basic electrical characteristics is possible because the GS610 can operate as a current source or a current sink. This source measurement unit is fully performing to your high capacity needs and includes remote control and easy file operation for ease of use. Four-dimensional operation with source operation (current source) and sink operation (current sink) is possible at up to 110 V, 3.2 A, and 60 W.
The output and measurement resolutions are 5.5 digits. The GS610 is made up of a constant current source, a constant voltage source, a voltmeter, and an ammeter. Each function can be combined into numerous operation modes. Additionally, control and measurement using a two-wire system or a four-wire system are possible by switching local sensing and remote sensing internally. The voltage/current generation block of the GS610 operates in DC generation mode or pulse generation mode. Four operation modes-continuous output, linear sweep, log sweep, and program sweep-are available for each generation mode. In program sweep mode, the user can define an arbitrary sweep pattern. 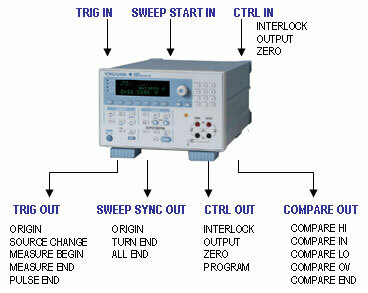 The output level can be changed at a minimum of 100 µs intervals in each sweep mode. 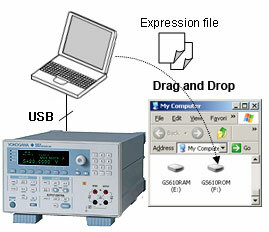 Source measure cycle (source & measure at 1 ms minimum)As shown in the figure below, the GS610 is capable of synchronizing the generation and measurement at any operation mode. Generation is started after a source delay with respect to an internal/external trigger. Then, after the time it takes for the source level to stabilize (measure delay) the measurement is carried out over a given integration time. This function is necessary when making measurements by waiting for the load response after applying a pulse. 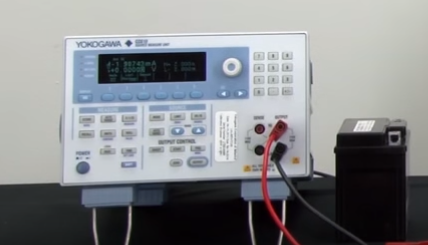 The source measure cycle is the minimum unit for signal generation and measurement. The source/measurement operation (source measurement cycle) on the GS610 is 1 ms minimum. The sweep operation can be used to make two measurements, then the difference between the two measurements can be determined. When the source value of sweep data 1 is established, the first measurement is carried out. Then, when the source value of sweep data 2 is established, the second measurement is carried out. The difference is determined by subtracting the value of the second measurement from that of the first measurement. By carrying out the two measurements within a short time, highly accurate measurements are possible with the effects of offset fluctuation cancelled. In addition, by applying a voltage with equal magnitude but opposite in polarity (source 1 = -1× source 2), the effects of offset error caused by the thermo electromotive force at the junction can be cancelled. The zero generation function of the GS610 enables the generation of the voltage/current zero value as well as the switching of the output condition between high and low impedance. In the zero generation condition, the voltage application or current supply to the load can be stopped with the output relay turned ON. This function avoids the problems of chattering and contact life of the output relay and reduces the ON/OFF operation time of the output. - Low impedance: The current limiter is set to the specified value. - High impedance: The current limiter is set to 0.5% of the range. - Low impedance: The voltage limiter is set to 0.5% of the range. 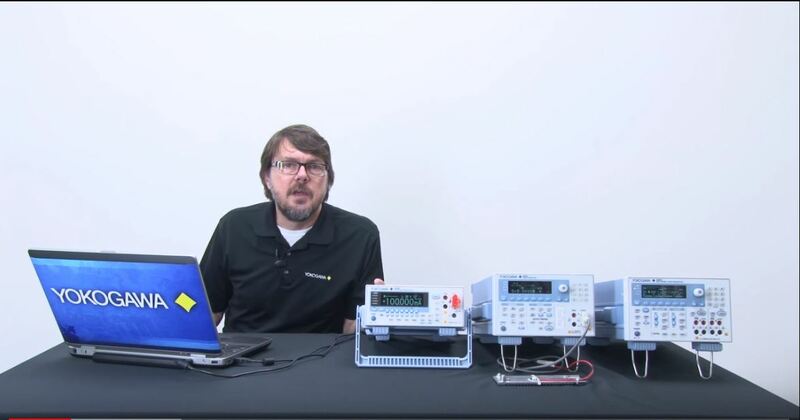 - High impedance: The voltage limiter is set to the specified value. The GS610 has various external input/output connectors. 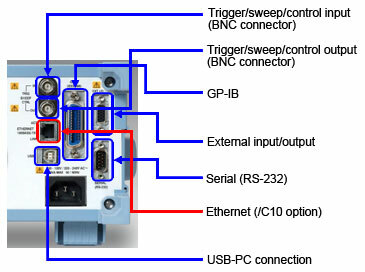 Signals such as the trigger input/output indicating the timing of generation and measurement, the output relay ON/OFF control signal, the zero generation ON/OFF control signal, and the comparator judgment result output can be input/output from the BNC and multi-core connectors. In addition, multiple GS610s can be synchronized by simply connecting the trigger output of a GS610 to the trigger input of another GS610 using a BNC cable. 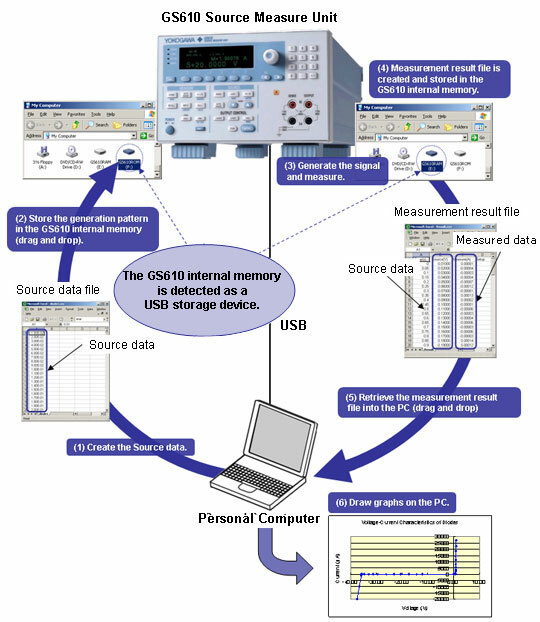 When the GS610 Source Measure Unit is connected to a PC via the USB, the PC detects the GS610 internal memory as a USB storage device. A pattern file can easily be stored in the GS610 internal memory by creating the GS610 generation pattern on a general-purpose worksheet application (1) and dragging and dropping the pattern file (2). The GS610 sweeps the voltage or current levels according to the generation pattern that is written in this file, measures the load current or load voltage at the appropriate points (3), and stores the results to the GS610 internal memory (4). There is absolutely no cumbersome programming or installation of dedicated software programs required (5) and (6). User-defined computation can be performed on the GS610 by combining dedicated operators. It can be used to carry out linear conversion of measured values, compute the power, compute the next generated value from the current measured value, and perform real-time computation of generated data using expressions. The expression is created using a text editor on your PC and stored to the GS610 internal memory via the USB. Remote control and file transfer can be carried out over the network by installing the Ethernet Interface (/C10 option). The GS610 connected via the Ethernet interface can be controlled from Internet Explorer. 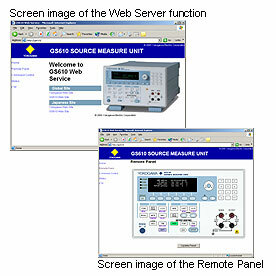 Displays a front panel image of the GS610 on the browser with which the GS610 can be remotely controlled. The GS610 internal memory can be handled as a PC file server. The output pattern can be transferred to the GS610 internal memory, or the measurement result data can be loaded in the PC. The GS610 can be controlled using commands similar to GP-IB or RS232 commands. Up to five clients can connect to the GS610. Select trigger input, sweep start input, or control input. Select trigger output, sweep start output, or control output. An interface used to remotely control the GS610 from a PC (IEEE 488 compliant). Synchronization control signal with other devices and comparator judgment result output. Complies with 100BASE-TX/10BASE-T. Can be used to carry out FTP file transfer. Used to connect to a PC and enable the GS610 internal memory to operate as a USB storage device.